The disaster events of January 12th to the country of Haiti is proving to be a daunting task for the entire world community. Lynden Air Cargo in coordination with USAID and countless others is accomplishing the goal of providing seamless support to the Haitian community. The result of this tireless effort ultimately is saving lives. As a crew we were fortunate enough to be part of this great effort. The ground crews of Lynden and USAID in both Washington-Dulles and Haiti displayed unparalleled team work, that ultimately assisted the flight crews to maintain the highest standard. 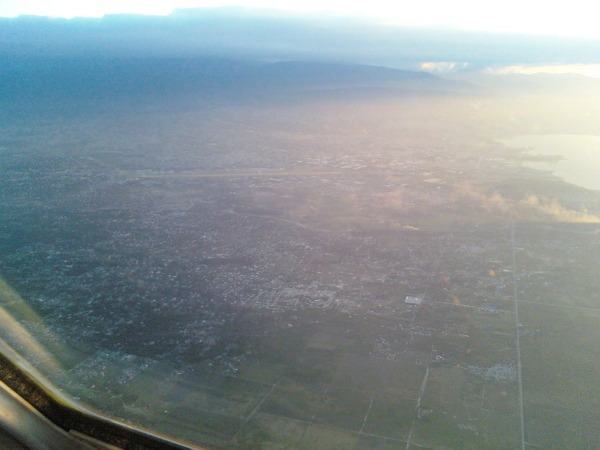 Upon arrival into Haitian airspace the calamity of events was apparent. All air traffic control was maintained by 1 man with 1 radio. His professionalism kept control of an incredible situation. In the 2 hours that we spent on the ground 50 aircraft came and went. The airport ramp is no larger than 5 football fields that services a runway with one taxiway. Up to 20 aircraft from DC-3's to 767's littered the ramp at any given time. 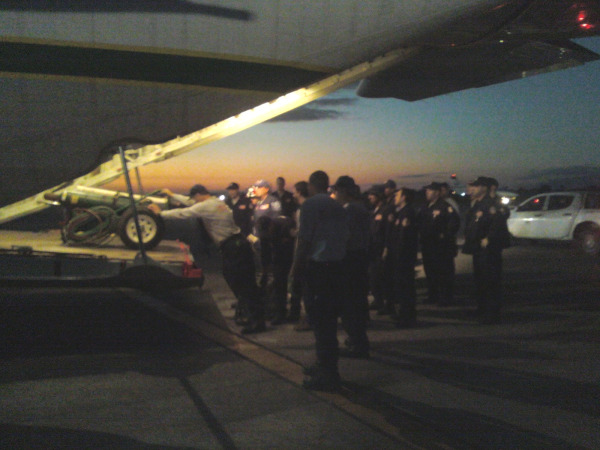 People strewn the ramp assisting others unloading and loading aircraft in order for them to return with more aid. The coming days will be a daunting task for all who are aiding Haiti. The high standard of Lynden Air Cargo and USAID begins with everyone, including the Loadmasters, Mechanics, Dispatchers, Aircrew, and the countless others that it takes to operate at this level of merit. Photos: 1) Lynden Air Cargo's N405LC on approach into Haiti. 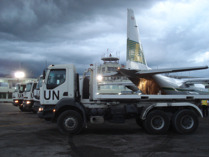 2) On the ground in PAP offloading supplies to UN. To learn more about Lynden's Haiti relief flight involvement, please visit our relief flights information page. Everyone at USAID has been super friendly to work with. Upon arriving at IAD our crew was replacing the previous crew coming back from Lynden's first flight into PAP, lead by Capt. James Wallace. Loading of our Herc was already in progress when we got to the airplane. We took off from Washington-Dulles Intl Airport (IAD) at about 4 am for our 4 1/2 hour flight to Port Au Prince (PAP), Haiti. When we began our approach to the airport it was very apparent that we weren't the only ones bringing relief supplies. 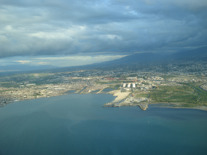 The earthquake had taken out all services at the airport, including radar and ATC (Air Traffic Control) capabilities, which created very difficult conditions for the authorities, but they handled the extraordinary amount of inbound air traffic to Haiti commendably. We were placed number 13 in a list of planes to land and held in a pattern overhead before we diverted to Puerto Plata (POP), Dominican Republic to get more fuel and give it another try. After obtaining clearance to take off and head back to PAP we encountered yet another delay that had us circling overhead PAP again, but we finally landed and offloaded our supplies. Might I add that the main reason for the delays really isn't because of the lack of radar or modern ATC control, it's the lack of ramp space and movement. PAP's ramp, terminal and taxiway were built to handle a half-dozen flights per hour, and now with relief needs, are tasked with handling 3 times that much traffic. The best way I can describe it is a four-lane interstate highway being cut down to one lane. The people from USAID met our plane once we parked and off-loaded most everything by hand. As you can imagine forklifts were in great demand with few and far between available. Everything from small helicopters to Boeing 767's were parked tightly on the ramp. The terminal building was abandoned with large visible cracks in the structure and the control tower's windows had all been shattered and busted out. The runway, taxiway and ramp all seemed to be in surprisingly good shape, thank goodness. We were on the ground for an hour and 45 minutes before we headed back to POP for fuel and our return trip to Denver. I'd like to recognize everyone on the Disaster Relief Team in Washington, DC for all their efforts and coordination concerning our flight into Haiti, and I'd like to thank my crew, Randall Sanderson (FO), James Seefeldt (FE), Ted Pederson (MX) and Bob Lesko (LM) for their extraordinary efforts and professionalism. Without their dedication to the job, this simply would not have been a success. 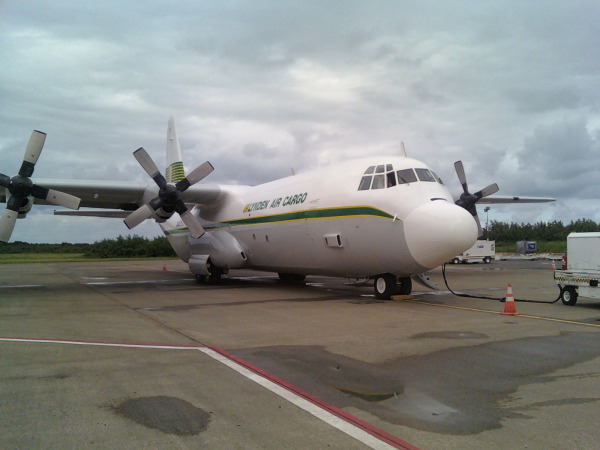 Photos: 1) N405LC waiting in Puerto Plata, Dominican Republic. 2) Aerial view of PAP. 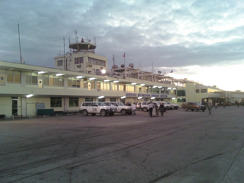 3) Terminal building and control tower in Port Au Prince. 4) USAID personnel offloading cargo in PAP.